By now, you’ve probably seen and heard about a lot of the new features that are available in JMP 13 and JMP Pro 13. To help demonstrate those features, the documentation team has added nearly 60 new sample data tables to the Sample Data Library. As a reminder, you can access the Sample Data Library through the Help menu. There are more than 500 data tables in the Sample Data Library. I’d like to highlight a few of the new ones in this blog post. The Sample Data Library in JMP 13 includes nearly 60 new sample data tables that help demonstrate new capabilities in the software. There are two new tables based on the old favorite, Big Class. Big Class Families illustrates new modeling types and Expression columns in a data table. It provides more data (including pictures) of the fictional Big Class students. World Class contains the original Big Class data columns with multiple language translations of the names for the fictional students. 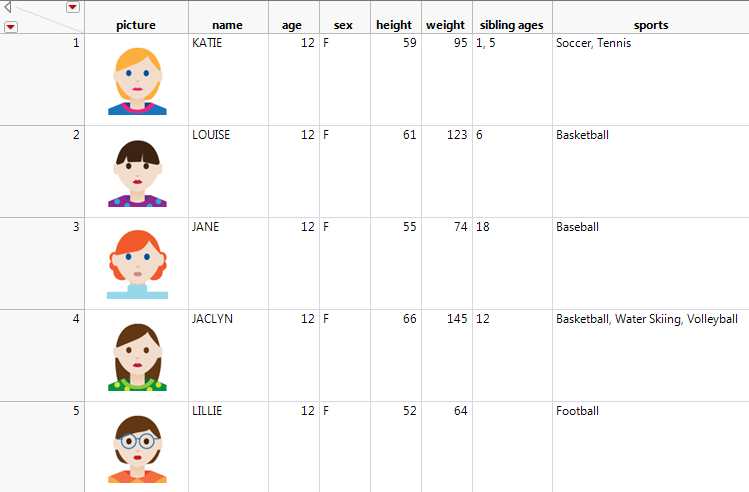 Big Class Families is a new sample data table in JMP 13 that illustrates new modeling types and includes pictures. To support the new virtual join feature, we have added some fictional movie rental data that are split across three data tables: Movie Customers, Movie Inventory, and Movie Rentals. These tables are already linked together so you can try out the virtual join feature right away. We have included Nicardipine, a data table that has shipped with JMP Clinical for a number of years. 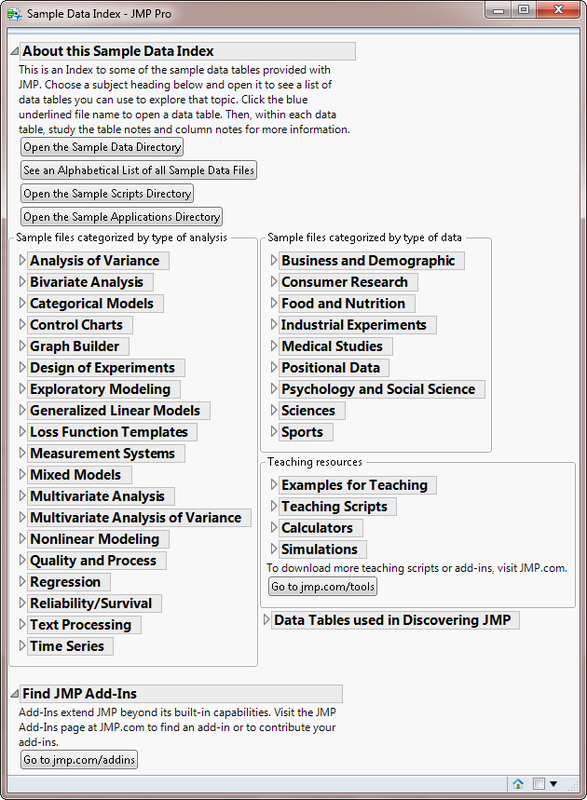 It is an example of a typical study that can be used to illustrate many exploratory techniques, including Recode, Grouping columns, Graph Builder, Distribution, and Predictor Screening. For text analysis, we have added Aircraft Incidents, which is a collection of US aircraft incident reports for the year 2001. These reports come from the National Transportation Safety Board (NTSB) and constitute a commonly used data set for text analysis. We also have a simpler data table for trying out the new Text Explorer platform -- Pet Survey is a fictional data table of text responses of pet owners to an open-ended question about their pets. To support the Generalized Regression personality of Fit Model, we have added Catheters. This data table contains attempts to start intravenous catheters along with many other predictive variables. This table can be used to demonstrate variable selection with binomial, Poisson, and negative binomial response distributions in Generalized Regression. The VA Lung Cancer IV data table is based on the VA Lung Cancer data table that has been included in JMP Sample Data for many releases. It has been modified to illustrate interval-censored responses. The Generalized Regression personality of Fit Model can now accommodate interval-censored responses. New covariance structures were added to the Mixed Models personality of Fit Model. Growth Measurements (based on a data set in the SAS PROC MIXED documentation) illustrates the Toeplitz Unequal Variances covariance structure. Although the Unstructured covariance structure isn’t new in JMP13, we added Wafer Quadrants to support an example in the Mixed Models chapter of the documentation. Consumer Prices contains Bureau of Labor Statistics (BLS) data on monthly prices of consumer goods and illustrates the new Process Screening platform in the Analyze > Screening menu. It also contains a script to split the data by the type of product. The new split table illustrates the Explore Missing Values platform in the Analyze > Screening menu. Grocery Purchases is used in an example of the new Association Analysis platform in the Analyze > Screening menu. To illustrate the new Sparse method in the Principal Components platform, a split version of the Adverse Reactions data table, AdverseR Split, has been added. Drosophila Aging Distances is an example that uses a distance matrix in the Hierarchical Clustering platform in the Analyze > Clustering menu. Also, for the Hierarchical Clustering platform, Wafer Stacked has been added to illustrate the use of the new spatial clustering measures for wafer maps. Health Risk Survey contains data from a Centers for Disease Control (CDC) survey on risky behaviors. This table illustrates the new Latent Class Analysis platform in the Analyze > Clustering menu. In the Process Capability platform, you can now fit non-normal distributions. We have added two new measurements data tables that can be used to illustrate these distributions: Process Measurements and Tablet Measurements. Four new tables (prefixed with “Potato Chip”) illustrate the new MaxDiff platform in the Analyze > Consumer Research menu. Pizza Combined No Choice illustrates the new No Choice option in the Choice analysis platform. This table is identical to the existing Pizza Combined sample data table, except that there are some missing responses in the Indicator column. The new Multidimensional Scaling (MDS) platform in the Analyze > Consumer Research menu can be illustrated with the new Flight Distances and San Francisco Crime Distances data tables. The first table contains flight distances in miles between major US cities. The second table is a dissimilarity matrix based on the existing San Francisco Crime sample data table. In the design of experiments (DOE) area, we have added a number of new data tables to illustrate various design methods. Candy Profiles and Candy Survey are used in an example of a MaxDiff experiment. Coffee Choice Factors, Laptop Factors, and Weld Factors were all added to facilitate automatic loading of factors into JMP for examples in the documentation. This is especially helpful for experiments with many factors. Binomial Optimal Start is used in an example of a Nonlinear Design. Extraction3 Data is used in an example of the Fit Definitive Screening platform. Torque Prior is used in an example of an ALT Design. Peanut Data and Peanut Factors represent an example of a definitive screening design. Algorithm Data and Algorithm Factors illustrate a Gaussian Process model that contains categorical factors, which is a new functionality of the Gaussian Process platform for JMP Pro 13. Finally, Binomial Experiment and Catalyst Design were added to illustrate the new Simulate feature in JMP Pro 13. In the reliability area, we added eight data tables (prefixed with “CD”) that can be used in the new Cumulative Damage platform. This platform can be used to analyze accelerated life tests where the stress levels are allowed to change over the time of the experiment. There are four pairs of sample data tables; these pairs correspond to the four tabs in the Cumulative Damage launch window. Each tab requires a time-to-event data table and a stress pattern data table. The Reliability Growth platform launch window now has two new tabs as well. The new Concurrent Systems data table has data that are in the correct format for the Concurrent Systems tab. There are four data tables (prefixed with “Parallel Systems”) that illustrate various scenarios that are appropriate for the Parallel Systems tab. Finally, we added Device X Lifetimes and Small Production Time to Event. The first of these tables was added to highlight the new ability of the Generalized Regression personality of Fit Model to handle censored data as well as Cox Proportional Hazards models. The second table was added to illustrate the Time to Event data format in the Reliability Forecast platform. The post New sample data tables in JMP 13 appeared first on JMP Blog. The post 5 more things you don't know about JMP appeared first on JMP Blog. The post 5 things you don't know about JMP appeared first on JMP Blog. The post How to combine Squarify and Split layouts with hierarchical Treemaps appeared first on JMP Blog. The post Squarify: Treemap's new tile layout in JMP 12 appeared first on JMP Blog. The post Appearing for 3 days at the Quad... appeared first on Key Happenings at support.sas. The post This is not just another pretty face appeared first on Key Happenings at support.sas.